In the Exeter-Milligan Physical Science class, we currently are working on the properties of elements, compounds and mixtures. It's important to be able to distinguish the difference between the three compositions of matter. One way to do this is through experimentation. Conservation of Mass was the topic for this lab; students were asked to determine whether mass is conserved in a chemical reaction. 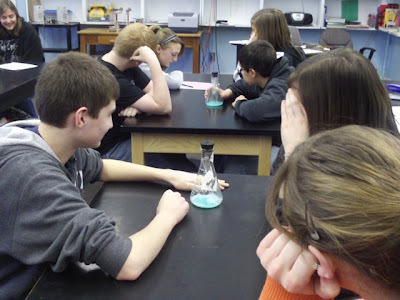 Students in the following picture are observing their final step of the lab. Conservation of Mass states that there is no loss or gain of mass during any chemical change.